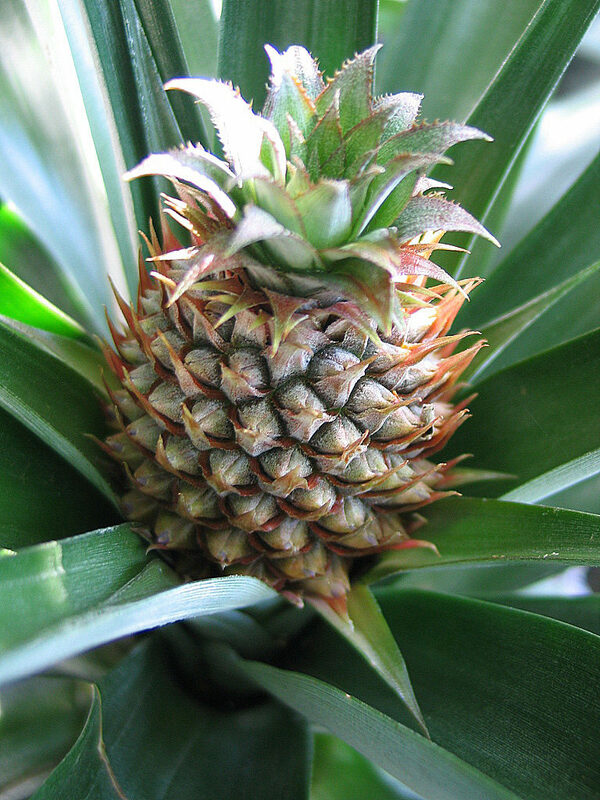 A review of the pineapple family and what the botanical classifications of family, sub-family, genus and species mean in plant medicine. Take a Tour of the Skyflowers! In 2 minutes flat, you will learn how the professionals choose flower remedies. Scroll down and let’s begin. Mother Natures Secrets. On One Page. Let’s start our tour with the page you are on. At the top of the page are the information filters. The first set of grey tabs are all about (1) our plant research and (2) the second row filter the picture gallery. But all of that’s advanced stuff. You can click around later and look at them at your leisure. For now, let’s keep it simple. Let’s choose some flowers and make a flower remedy combination. There are many ways to choose flower remedies. The Skyflowers uses the old school, traditional method of plant knowledge and the latest in botanical science to help you choose the right remedy for your issue. Yep, we go ‘straight to the horses mouth’ and learn from the best source of information about the remedies there is – mother nature! 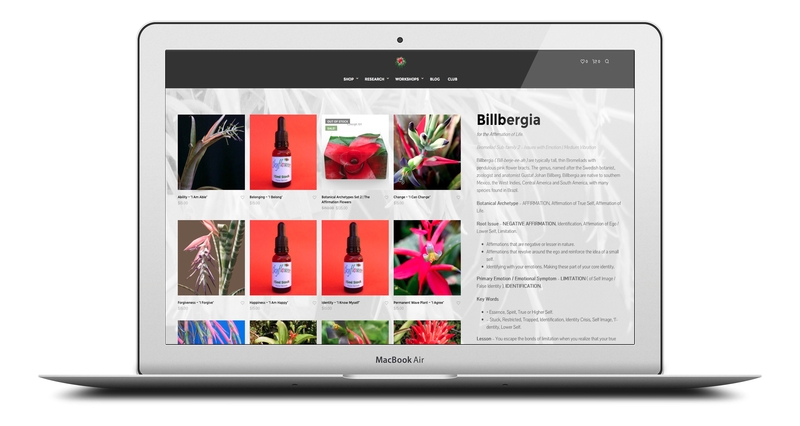 You may be asking, ‘when choosing from our catalogue of over 150 remedies, where do you begin?’ You start by choosing from 1 of the 21 plant groups listed on this page. When starting out you can choose from the plants that draw your attention. Later, when you are a pro and know your stuff, you will know exactly which plant groups to choose. 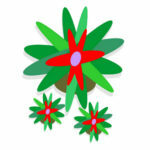 The Billbergias are a good place to start when making a flower combination because they are the Affirmation flowers. They help you to overcome your limitations so let’s choose the Flower of Ability, Billbergia mexicana as our affirmation. Once you have picked out an affirmation flower for yourself, we will choose a remedy to support it. Flowers that combine really well with the Affirmation flowers come from a wild and colorful plant group, Genus Aechmea. 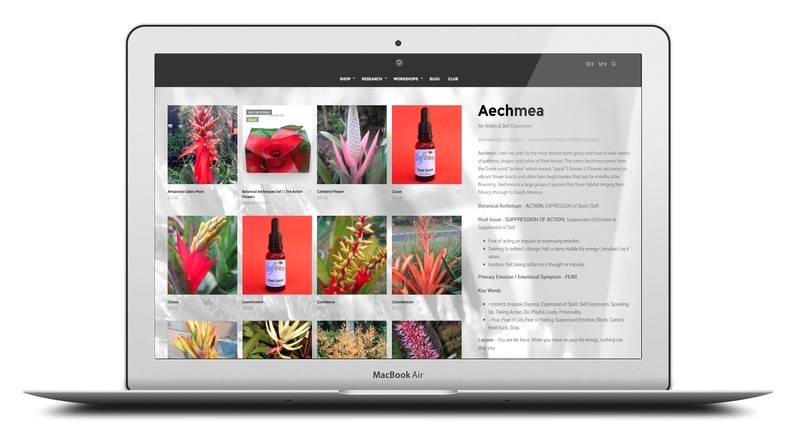 The Aechmeas are flower remedies for Action and Self-Expression. They help you to overcome your fears and bring out your ‘true colors’ so that you shine. When you combine one of these with an affirmation flower, there will be no stopping you! 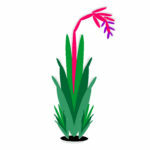 Let’s combine the Flower of Ability with the Flower of Passion, Aechmea recurvata to help us take action. Now that we have an Affirmation flower to overcome our limitations and a flower remedy that will help us take Action, let’s add a third type of flower remedy to support the first two. Let’s add a flower from genus Neoregelia. These flowers are for Perceptions and Beliefs. They help you to ‘plug in a new set of eyes’ and look at life differently! By the way, take a close look at the plants. Can you see the eyes looking back at you? Mother nature designed her plants with clues that tell us what they are used for! Genus Neoregelia was the plant group that helped lead me to discover ‘botanical archetypes’ and helped me to ‘see’ that every plant group was used for a very different job. Let’s add the Blushing Heart, Neoregelia carolinae to our combination. “I Can… Live Passionately… and Am True to Myself.” Wow, what a statement! End of Our Tour. Start of Your Training. You get the idea. You have a deep level of information at your disposal when using the Skyflowers. You will be guided by mother nature. These 3 plant groups are a great place to start when making a flower combination. Once you have these flowers mixed together you may want to add a flower from Genus Vriesea like the King of Bromeliads to Clarify Your Thinking or maybe something from Genus Quenelia to Return to Your True Self. The sky is the limit. The choice is yours. Take a look at some the other plant groups and build your own flower combination to suit your exact needs. 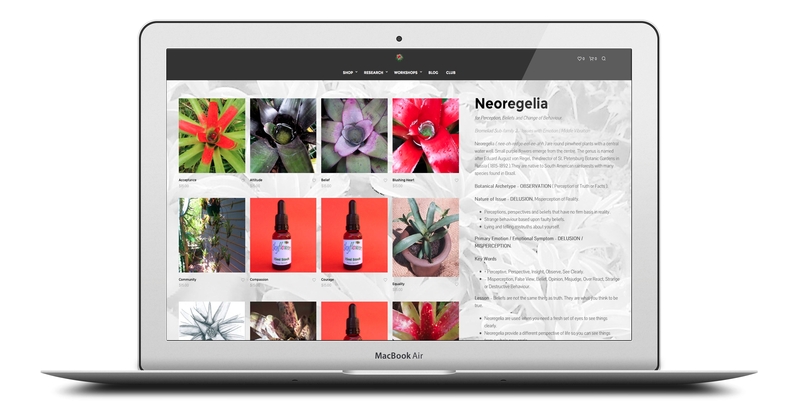 Natural therapists, kinesiologists and flower therapy students can use this page to create a custom-made flower toolkit that matches their work. There are plant groups for every type of therapy. 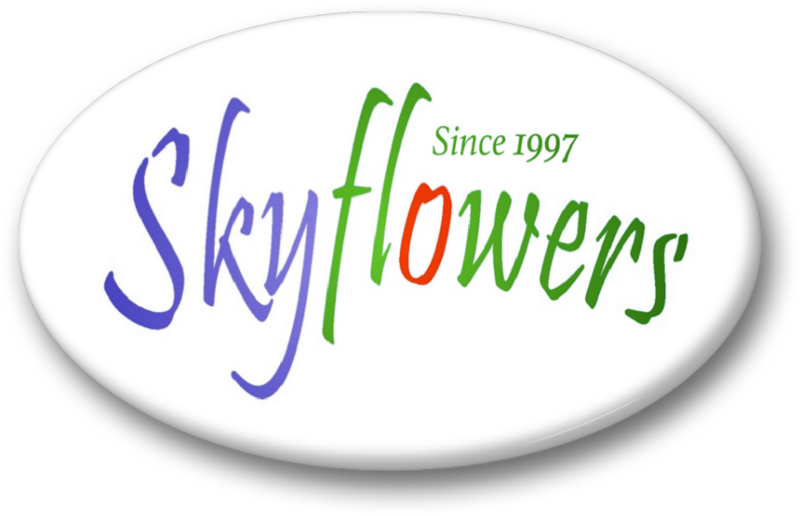 Bookmark this page and use it as your ‘home base’ when working with the Skyflowers. Enjoy exploring the botanical archetypes and thanks for taking the tour. 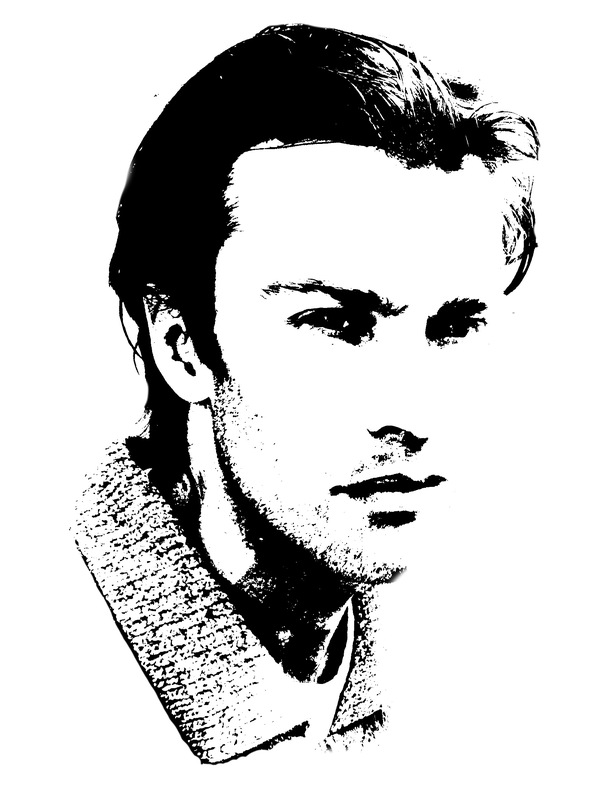 Brendan Rohan – founder of the Skyflowers. A ‘Botanical Archetype’ ‘provides background knowledge about the therapeutic properties of a plant family and their effect on the mind / body system. Botanical – adj. Relating to plants or the science of botany. Archetype – n. An ideal example of a type. 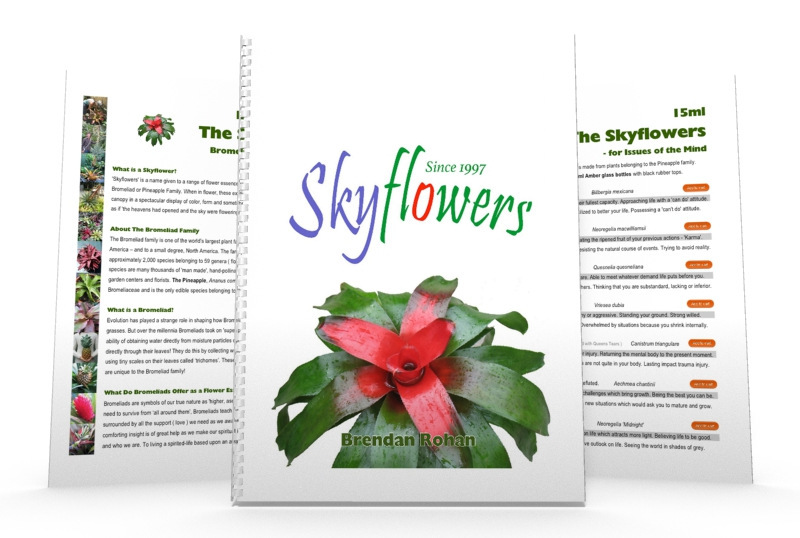 The Skyflowers uses an original diagnostic system called Botanical Archetypes. This is our own research work. Botanical Archetypes are based upon the framework provided by botanical science, botany and plant classification to learn the properties of entire plant families, not just individual species. Botanical Archetypes translate whole plant families, sub-families, genus & species into human, emotional terms. Botanical Archetypes provide a deep insight into the *cause ( *genus ) of the issue ( **species ). Botanical Archetypes provide greater precision in Clinical Flower Therapy. Special botanical symbols like this one are used in all of our books, clinical manuals and charts to help you get the most out of flower therapy. Look out for them! In botany, (1) a plant family is made up of plants that have (2) similar traits and physical characteristics. In vibrational medicine, the plant family represents the general philosophy of the plants in the family, the overall ‘spiritual lesson’ to become aware of and the life attitude to adopt. In the case of the Bromeliad family, the spiritual lessons revolve around self-reliance and an ability to ‘float through life’. These qualities are imparted by every flower remedy made from Bromeliads, no matter the remedy. It should be noted that the ‘spiritual lesson’ is something to ‘become aware of’ rather than something that you ‘need to learn’ and ‘do something about’ to make it happen. The lesson is about moving into alignment with natural law. A law that is already in operation. In this light, flower therapy is primarily about ‘raising awareness’, not merely ‘dealing with ’emotional issues’. Botanical Archetypes help with this process. Now that you have seen an overview of the Bromeliad family, let’s look at the next level of structure – sub-families. There are 3 sub-families in the Bromeliad family, which means there are 3 types of flower remedies in the Skyflowers range. Sub-Family 1 – (1) The first type deals with Issues of Thought. These remedies help you to focus your mind on a clear outcome, adjust your thought patterns and raise your standard of thinking to a higher level. Sub-Family 2 – (2) The second type deals with Emotional Issues. These remedies help you to behave in a manner that is in alignment with your goals, act on your higher intelligence and express your true spirit through physical actions. Sub-Family 3 – (3) The third type deals with Issues with Reality. These remedies help you to face reality, anchor change and ground your higher consciousness on the Earth. This type is for ‘long term patterns of consciousness’ that have resulted in very real circumstances or ‘karma’. The 3 types of flower remedies depict a spectrum that spans from consciousness to the physical world. The remedies deal with (a) problematic thoughts, (b) the actions you take based upon those thoughts and finally, (c) the consequence of those actions. Although this explanation is clear and straightforward, it has vast ramifications when working with the Skyflowers. It also changes the perception that flower therapy is for ’emotional conditions’ and broadens the definition to it being for ‘issues of consciousness’. Below sub-families is another category of plants called a genus. A genus is a group of species and is the 2nd last category in the heierachy. If the plant family represents the ‘life attitude and spiritual lesson to be learned’ and the sub-family relates to ‘the level that the issue exists at’, then the genus represents the ’cause of the issue’. And how it is held in consciousness. Much research has been done on The Skyflowers to detail the causes associated with the remedies. This research is original work and is something of a ‘world first’ in plant medicine. The last grouping of plants in a plant family are the species. The species depicts the emotional symptom. Yes, the genus is the ’cause’ and the species is the ‘effect’! Most ranges of flower remedies only research the information relating to the species. The Skyflowers has researched the whole family to provide a deeper level of information to help with your flower therapy work. Plant Family – Bromeliaceae, the Pineapple Family. Sub-Family 1 – Tillandsioidiae, the Air Plants. 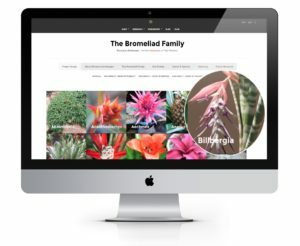 Sub-Family 2 – Bromeliodieae, the Forest Bromeliads. 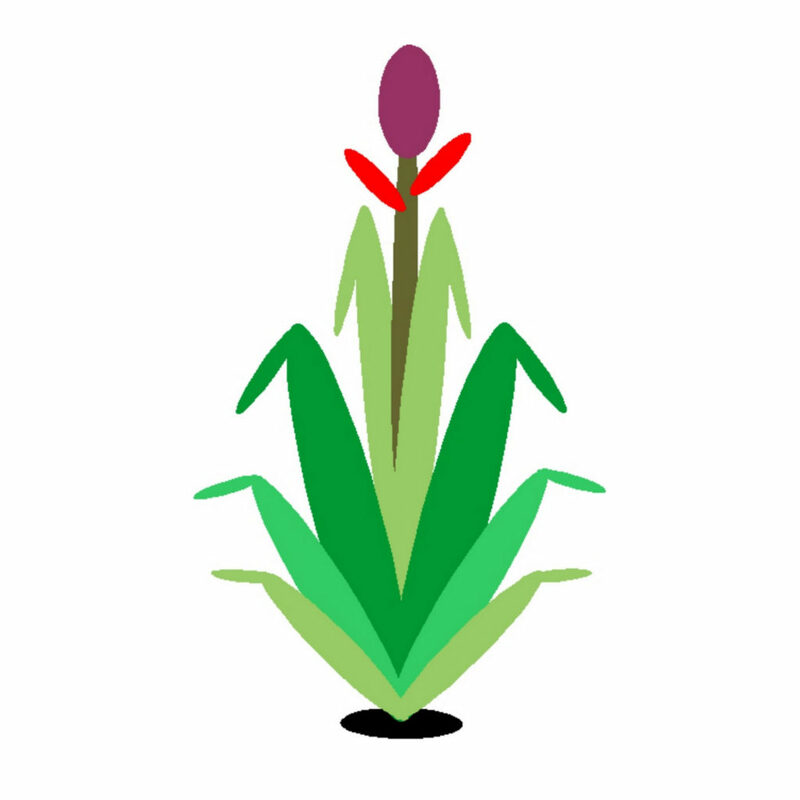 Sub-Family 3 – Pitcairnioideae, the Terrestrial Bromeliads. Species – 2000+ species. Plus many thousands of cultivars and hybrids. Habitat – Southern Coastline of North America, Central America & South America. About – The Bromeliad family is one of the world’s largest plant families – the Daisy family is the largest. The Pineapple, Ananus comosus is the only edible species of Bromeliads. The Blushing Heart, Neoregelia carolinae and the Silver Vase, Aechmea fasciata are the most recognized in the floristry trade. 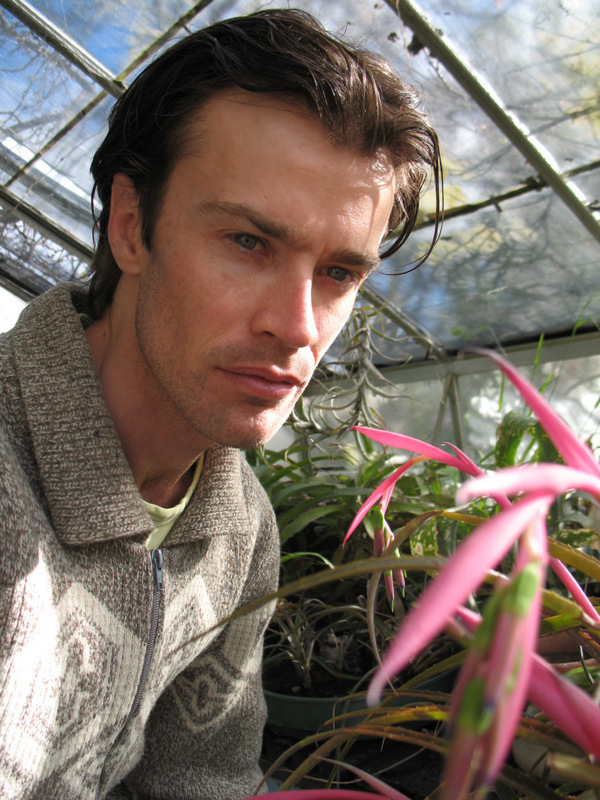 Culture & Care – Bromeliads are highly robust, low water plants that are as tough as many succulent plants. What makes them so robust is the presence of tiny silver scales found on their leaves called ‘trichomes’. These tiny scales act as suction cups that capture moisture found in the surrounding air and draw it in directly through their leaves. This advanced ability has several advantages as the moisture not only feeds the plant, it also acts as a coolant on the surface of the leaves, keeping them protected from extremes of heat during the day. The presence of trichomes, found on all Bromeliads, makes these plants self reliant – which is a signature trait and property found in every Bromeliad flower remedy. Spiritual Lesson – ‘Relax and Unfold’. Due to their robust, self reliant ways, Bromeliads teach us that we can relax about life. The core philosophy, ‘relax & unfold’ is a shortened version of ‘relax into the experience of life and allow life to unfold.’ A wise teaching from mother nature that suggests we ‘make progress in life’ not by effort, but by relaxing into the experience of life that is unfolding around us. As we move with the current of life, life ( not our mind ) chooses what needs to change, grow and be. The statement made by the Bromeliad family is a beautiful affirmation of the life-giving nature of life. And the fact that we are already growing, learning and unfolding as human beings just by participating in life. Without us needing to do anything but ‘be’. We have entered ‘the age of conscious medicine’. We can now know with clear certainty the effect of a medicine on the mind and the body and the spirit. Botanical science provides us with a framework we can use to know the properties of whole groups of plants, not just single species – in the case of genus Tillandsia, this means as many as 800 hundred species can be classified! Botanical Archetypes can be applied to other flower remedies such as the Bach Flowers. For those that have vision and understand the ramification of this discovery, Botanical Archetypes has an impact all plant-based medicines such as Homoeopathy, Herbalism, Naturopathy, and Aromatherapy. Furthermore, Botanical Archetypes can be used to better understand the plants we eat, paving the way for a new perspective of the human diet. 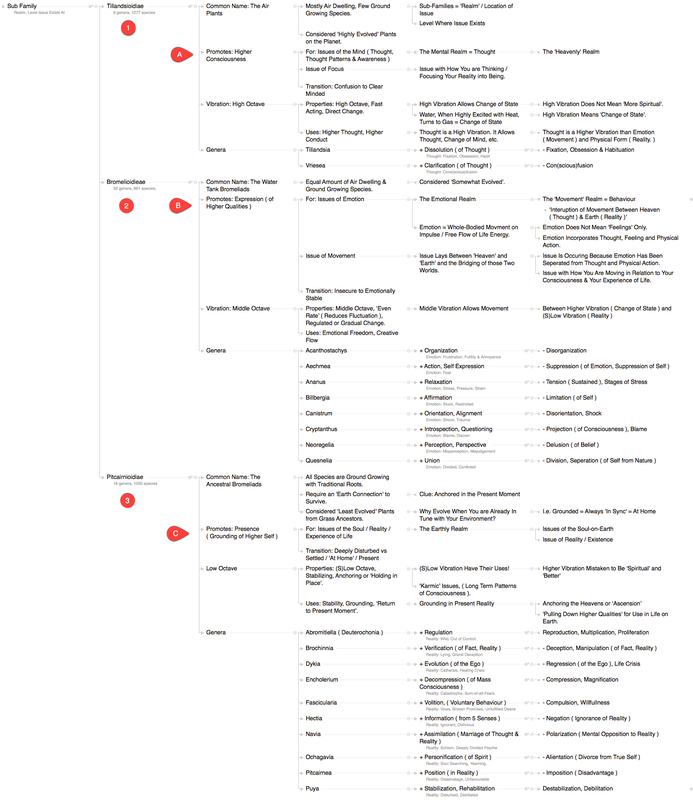 The research on this page has taken years to put together and refine. Our initial work with the Bromeliad family provides us with a template we can use to translate other plant groups into human terms. The roadmap for The Skyflowers Project is clear. We will go beyond the Bromeliad Family and begin translating food plants & common medicinals into their vibrational properties. First on the list are the world most common food plants. The list goes on but the objective is clear. To understand our diet and change the way we view food. There are several easy ways you can help to support The Skyflowers Project. Spread The Word – Share this page on social media or send it to people who you think should know about it. This work belongs to the human race and we cannot do it alone. 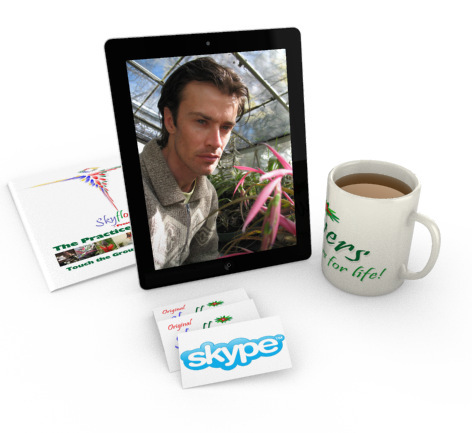 Go Shopping – Shopping in The Skyflowers Shop directly helps to fund the ongoing research and get our bills paid. With proper funding, I can sit at my desk and do what I do best. Continue my research into the next generation of plant medicine. Invite Me To Speak – Lectures and guest presentations are a great way of getting the work out there. If you can host a workshop or presentation, let me know. Botanical Archetypes are “The Next Generation of Plant Medicine”. This is My Lifes Work. Brendan, I met you many years ago at a Kinesiology conference in.Melbourne, and was fascinated by your work. I remember during our conversation we touched upon my air traffic control work and radar, because somehow my previous career helped me understand what you were explaining to me. Insight, help and inspiration will often come from the most unlikely places. Keep up the good work. Remember that many, many majorly gifted and inspirational people throughout history dud not get the recognition they deserved until years later, because they were ahead of their time. I remember you. Thanks for the comment on my work. Will you be back in Australia any time soon?